(AP Photo/Francois Mori)Visitors queue to see the interior of a C-5M Super Galaxy at the 49th Paris Air Show, June 25, 2011. 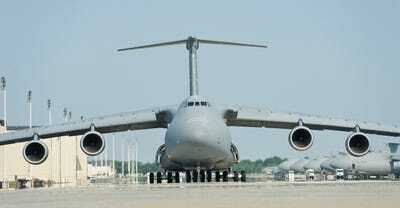 Lockheed Martin has finished upgrading 52 of the Air Force’s biggest plane: the C-5M Super Galaxy. The main element of the upgrade was a new, more powerful engine. The upgrades started in 2001 and are supposed to keep the massive plane in service until the 2040s. 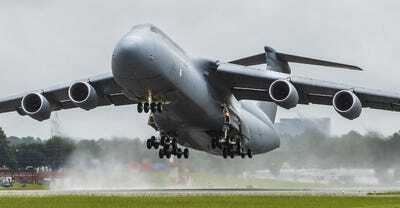 Lockheed Martin said earlier this month that the last of 52 upgraded C-5M Super Galaxy cargo planes had been delivered to the Air Force, finishing the nearly two-decade-long modernisation of the service’s largest plane. 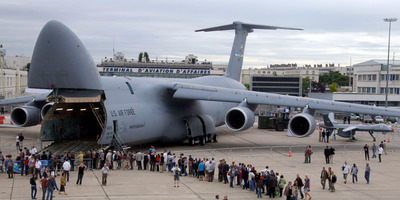 Lockheed began work on the Air Force’s Reliability and Re-engineering Program (RERP) in 2001 and turned over the first operational C-5M Super Galaxy, as the latest version is called, on February 9, 2009. In the 17 years since the RERP effort started, 49 C-5Bs, two C-5Cs, and one C-5A were upgraded, according to a Lockheed release, first cited by Air Force Times. The upgrades extend the aircraft’s service life into the 2040s, the contractor said. (US Air Force photo/Roland Balik)A C-5M Super Galaxy lands at Dover Air Force Base, Delaware, April 4, 2016. The program involved 70 modifications to improve the plane’s reliability, efficiency, maintainability, and availability, including changes to the airframe; environmental, pneumatic, and hydraulic systems; landing gear, and flight controls. The main new feature is more powerful engines, upgraded from four General Electric TF-39 engines to General Electric F-138 engines. 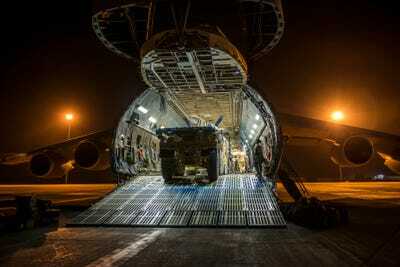 The new engines, which are also quieter, allow the C-5M to haul more cargo with less room needed for takeoff. “With the capability inherent in the C-5M, the Super Galaxy is more efficient and more reliable, and better able to do its job of truly global strategic airlift,” Patricia Pagan, a senior program manager at Lockheed, said in the release. All together, the RERP upgrades yield “a 22 per cent increase in thrust, a shorter takeoff roll; [and] a 58 per cent improvement in climb rate,” according to release, which said the modifications give the C-5M greater fuel efficiency and reduce its need for tanker support. (US Air Force photo/Staff Sgt. 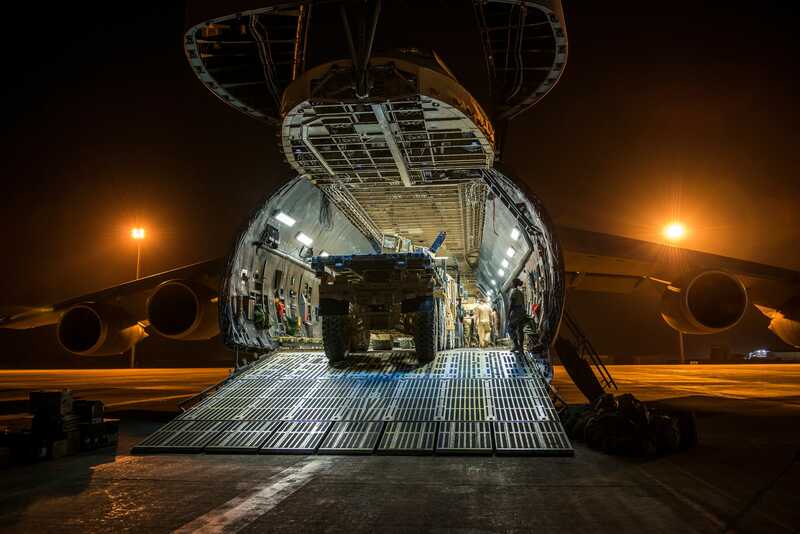 Jeremy Bowcock)Airmen and Marines load vehicles into a C-5M Super Galaxy at Camp Bastion, Afghanistan, October 6, 2014. The C-5 stands 65 feet high with a length of 247 feet and a 223-foot wingspan. 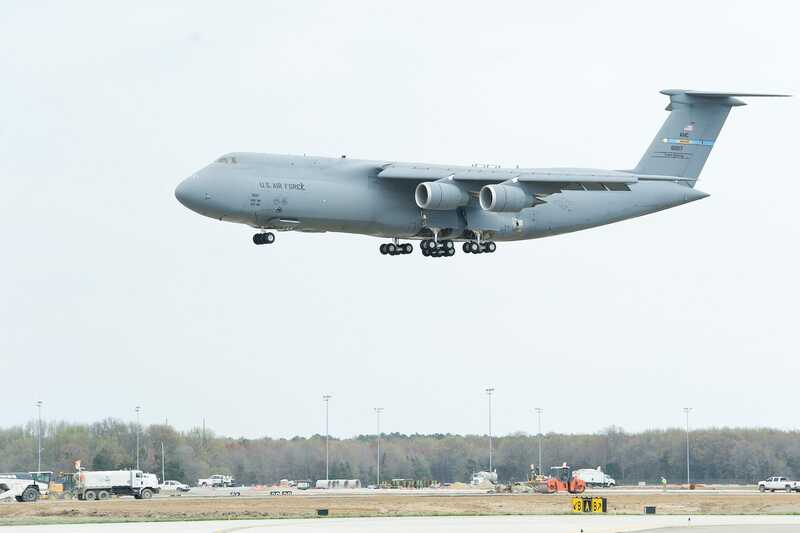 The upgraded C-5M can haul 120,000 pounds of cargo more than 5,500 miles – the distance from Dover Air Force base in Delaware to Incirlik airbase in Turkey – without refuelling. Without cargo, that range jumps to more than 8,000 miles. The plane can carry up to 36 standard pallets and 81 troops at the same time or a wide variety of gear, including tanks, helicopters, submarines, equipment, and food and emergency supplies. The first C-5A was delivered to the Air Force in 1970. By 1989, 50 C-5Bs had joined the 76 C-5As that were already in service. Two C-5Cs, modified to carry the space shuttle’s large cargo container, were also delivered in 1989. Lockheed MartinAn Air Force C-5M Super Galaxy taking off. The Air Force began a C-5 modernisation push in 1998, starting the RERP in 2001 with plans to deliver 52 upgraded planes by fiscal year 2018. The remainder of the C-5 fleet was to be retired by September 2017. But the C-5 fleet has face administrative and operational issues in recent years. Due to budget sequestration, a number of C-5s were moved to backup status in over the past few years, meaning the Air Force still had the aircraft but no personnel or funding to operate them. In early 2017, Air Force officials said they wanted to move at least eight C-5s from backup status to active status. “I need them back because there’s real-world things that we’ve got to move, and they give me that … added assurance capability,” then-Air Mobility Commander Gen. Carlton Everhart said at the time. In the months since, the Air Force’s C-5s have encountered maintenance issues that required stand-downs. 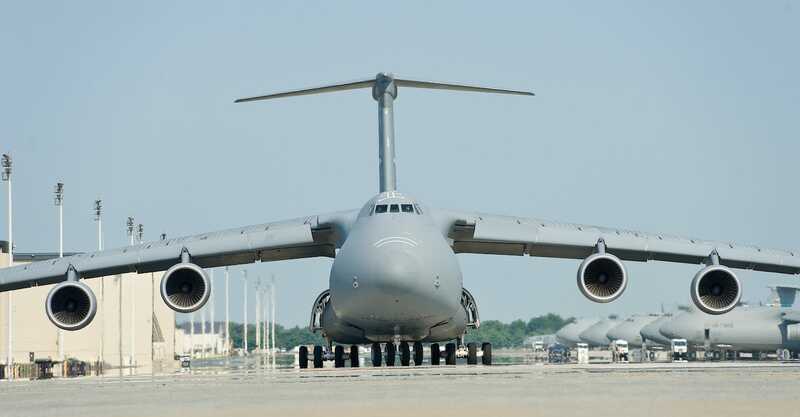 In mid-July 2017, Air Mobility Command grounded the 18 C-5s – 12 primary and six backups – stationed at Dover Air Force Base after the nose landing-gear unit in one malfunctioned for the second time in 60 days. Days later, that order was extended to all of the Air Force’s 56 C-5s, which had to undergo maintenance assessments. The issue was with the ball-screw assembly, which hindered the extension and retraction of the landing gear. The parts needed to fix the problem were no longer in production, however, but the Air Force was able to get what it needed from the “boneyard” at Davis-Monthan Air Force Base, where unused or out-of-service aircraft are stored. 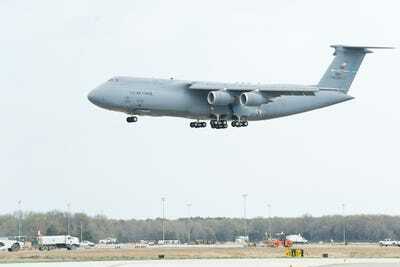 Earlier this year, the nose landing gear again caused problems when it failed to extend all the way for an Air Force Reserve C-5M landing at Joint Base San Antonio-Lackland. The plane landed on its nose and skidded about three-quarters of the way down the runway. The cause of the accident and extent of the damage were not immediately clear, but none of the 11 crew members on board were hurt.